It is a great honour to have this opportunity to speak at this distinguished venue. Although I have a very short time in which to speak, I would like to share with you about a project with which I was involved in Russia, China and several other countries. I moved to Moscow, then the capital of the collapsing Soviet Union, in 1990. It was a time of much social and economic turmoil, with people asking, “What is next?” From 1994 I also began working in the People’s Republic of China. As you know, China is the most populous country in the world and is undergoing massive social, political and economic changes. Due to their “one child policy,” parents, educators and other concerned leaders in that society are facing a big question: How can we raise the younger generation to be selfless, when they grow up in homes as a single child? This is not a simple matter when such children are pressured to be Number 1 in everything they do. In both Russia and China, and for different reasons, the governments were facing a crisis on the question of how to educate their youth. In the West we also face many challenges, as our nations experience spiritual crises and moral confusion. Many of you will recall how a few weeks ago in the UK there was a sudden explosion of looting and burning. Initially the authorities seemed paralysed and unable to know how to respond. After regaining their composure, the police launched a massive offensive against the looters – with courts handing out severe sentences to anyone found guilty of being involved. People began to question the wisdom of this approach – considering it an attack on the symptoms of the problem rather than the roots. Beginning in the early 1990s, my colleagues and I at the International Educational Foundation, founded by UPF’s founder, Dr. Moon, began discussions with officials at the Ministry of Education in Moscow. As a result of joint programmes, we developed a special curriculum on character education called My World and I. We were careful to integrate issues that were familiar and relevant to the local population, working with linguists and experts on culture. In the former Soviet region we paid particular attention to the multi-religious and multi-ethnic nature of the newly independent countries. Our concern was to help young people develop an appreciation of the various faiths represented in these countries – so as to avoid divisions in societies such as we saw later in the former Yugoslavia. Our distinguished speaker Dr. Schwimmer earlier today mentioned the importance of helping young people appreciate the valuable role of religion. This is exactly how we felt – not to preach, but to appreciate the valuable role played by religious and spiritual values. Visiting China posed several challenges. In this country that was communist and officially atheist, we had to consider how to promote the concept of spiritual and moral values. Due to their Confucianist culture, however, the Chinese were very receptive to our approach. Over the ten years in which I worked in China, from 1994 to 2004, we held over 300 programmes for more than 250,000 participants on every level, from the national to the provincial to the local. I had the privilege of travelling to China over 60 times and could witness an overwhelmingly positive response from all levels of Chinese society. Unusually for China, the authorities were very accommodating in allowing us to present our ideas directly to students in all the major universities. We also co-published, together with various universities and other organisations, 43 books dealing with issues from drug abuse to the unique challenge of raising a single child. What were the ideas that we shared? Based on a concept known as the Unification Theory of Education, we approached the concept of education from a broader concept of education for life, which includes education provided by school systems, but also goes beyond that sphere. We see education as more than just the passing on of knowledge. Rather an important aspect of education lies in developing men and women of character who can use their knowledge and skills to serve their society in addition to earning an income. A fundamental concept in this approach sees education as a means to help people realize three fundamental “life goals.” These are, firstly, becoming a person of mature character; secondly, developing relationship skills needed to establish successful relationships and family; and, thirdly, the pursuit of excellence in the academic area of study with a view to serving society. The first goal, therefore, is to become a person of integrity – one whose words and deeds match, who practices self-control and who becomes a man or woman who can express love in an unselfish way. Looking at the above diagram, the base refers to “Cultivation of Heart.” The most fundamental place for this education lies in the experience of the family. It is also a lifelong learning experience. In UPF you will often hear us referring to the family as “the school of love.” This is because it is there that one experiences all levels of love, from the child’s experience through sibling, conjugal and on to parental love. As a person moves through life and experiences love in each level, he or she becomes a man or woman with a greater capacity to love and empathise. Strong and healthy families become the basis of a healthy society. The second fundamental education one should receive is education in the area of norms and ethics. This deals with issues of how we relate to others in a way that allows for harmony and helps us to love more easily. In the Orient there is still a much greater sense of the importance of ethics in all relationships. Thirdly, we feel it is important to encourage young people to strive for excellence in their chosen field of study. This is not just to succeed for their own sake, but also to become a person who can be an asset to society through contributing to the general welfare, based on their knowledge and skills. Academic and skills education should therefore always have a moral component. Just as a doctor pledges to uphold the Hippocratic Oath, and business education should always be accompanied by Business Ethics, students in all areas of study should be aware of the moral obligations associated with any career they choose. Unfortunately, this inverse pyramid represents the failed approach to education which lays all emphasis on education of knowledge and skills, with little or no attention to the education of values and ethics. To illustrate this point, I would like to conclude with a letter that was written by a headmaster in an American school. This person was a survivor of a Nazi concentration camp and understood that a good external education is not necessarily sufficient to produce a good person. I’m a survivor of a concentration camp. women and children shot by high school and college graduates. My request is: Help your students become more human. Your efforts must never produce learned monsters, skilled psychopaths, educated Eichmanns. Reading, writing and arithmetic are very important only if they serve to make our children more human. Mr. Jack Corley is an Irish citizen and has worked with the Unification Movement in Europe, the United States, Southeast Asia, the former Soviet Union and China. Between 1990 and 2005 he worked in the former Soviet region as Vice President of the International Educational Foundation and Secretary General of UPF Eurasia, and organized many conferences on character education in the People’s Republic of China. 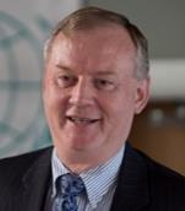 From 2006 to 2009 he served as Assistant Secretary General of UPF International. He currently serves as Eurasian Director of the Family Federation for World Peace and Unification and Chair of the Eurasian chapter of the Universal Peace Federation.